Is graffiti a form of art or is it vandalism? The lesson today focused on graffiti. We defined graffiti as markings, as initials, slogans, or drawings, written, spray-painted or sketched on a wall or other surface in a public place. The word originates from the Italian word, graffito, used to describe wall inscriptions found on ancient ruins in Pompeii. After some discussion, we came to the conclusion that graffiti is a creative way to express yourself. However, it is a punishable crime in New York City. Therefore, we agreed that none of us would be doing it ourselves! The word graffiti was pertinent to today’s lesson because we rode to 5 Pointz, Long Island City (LIC) in Queens. We drew a rough sketch of the five boroughs to orient our bearings. 5 Pointz is a sort of outdoor art gallery, showcasing prestigious artist’s graffiti localized on couple buildings. The graffiti at 5 Pointz was actually done legally since the buildings are privately owned. Sadly enough, however, we learned that 5 Pointz is about to be torn down and replaced with residential buildings. We all disagreed with this decision made by the city to destroy such a lively place. But, knowing that 5 Pointz will soon be gone, we were that much more excited and grateful to have the opportunity to explore it one last time! The task of the day was to photograph your favorite graffiti artwork and discuss why. After their ride last week on the hottest day of the summer, today the Ruff Ryders embarked on the coldest day we’ve had in New York! Pedaling over the Queensboro Bridge certainly kept us warm though! After a nice lesson from Dan and Jenne about the meaning of graffiti, we headed down to the pick up our bikes and head off! 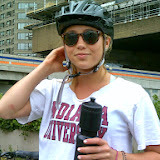 We had a new face with us since the East River ride, Alexis joined us for the first time since time trials! So our all-boys crew was no more, but we were glad to add another Ruff Ryder to the team! 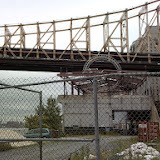 Then we headed down to the familiar East River path and headed south towards the dog parks! With no rest stops, we made it to the bottom of big hill, filled up our water bottles and climbed to the top! When we went to the bottom of the hill, Alexis had a little problem with the hand brakes and had trouble slowing down, but she got it after a little nervousness. 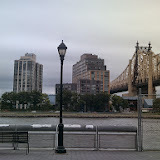 Then came the true challenge of the ride—the Queensboro Bridge across the East River. However, just like Tuesday’s ride, these kids pedaled to the top without a problem! At the top, we took a break to drink water and to take pictures. Estuardo said he could see his building from the top of the bridge, we were skeptical, but you really could see so much of Manhattan and Roosevelt Island! We coasted down into Queens, and Alexis did a particularly good job of using her hand brakes to go slowly! Great job Alexis! We rode on the road the rest of the way to 5 Pointz, and the kids did a great job at staying right and staying safe! 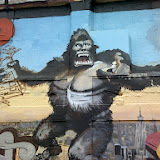 While at 5 Pointz, we toured the whole compound and took lots of photos. We even saw a man spray painting a piece called “Save 5 Pointz,” which reminded us that 5 Pointz will be demolished soon and it why it is important to see it now while we still can. The ride back to the Stanley Isaacs Center was nice and easy, especially because the Ruff Ryders were old pros at biking over the Queensboro Bridge, once back at the center we uploaded our photos and made comments! Overall a great trip by the Ruff Ryders! After this trip the Ruff Ryders have a total of 2627.5 points! Can’t wait for next week! 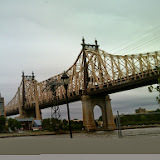 I like that photo becuase me and my dad cross that Queensborough Bridge. 😉 one one thing was hard to go up the bridge. 😉 I fetL that my feet hurt when i got to the top. ;)One part was fun going down the hill. It was fun go down the hill because you don’t need to peddle. The reason I chose this Picture Is Because it looks cool and sorta an illusion It looks like in the picture two guys facing opposite direction. But then you realize that the window looks like a river ready for them to jump in but the picture is a really nice piece and the best part was it was so up in the sky. Also this picture looks cool because it’s like saying I’ve Got Your Back Bro. My Favorite part about this day is that this Place Of Amazing Art was my first time here Seeing all this Graffiti. The challenging part about this day is that it was slightly cold and when we had to switch gears,climb up a large bridge,and to hold the breaks the entire time we when down. But the best part of this day is that this is never going to end until the summer camp is over. I like the picture of the bird because thats the coolest bird I ever saw. It was so amazing and I like the colors. It was blue and had white dots at the top and the hair was amazing. the wings were blue black and white and the tail is really long. I liked going down the hill at the end of the bike ride on the bridge. The hills were steep and the bridges were kinda good because Queens Bridge is amazing. 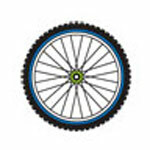 Going up the hill was challenging and I had a problem with my brakes. i finally got to Queens on a bike and that was my first time doing that and it was fun we went to see the graffiti wall and took pictures and the one i took was a word that that i didn’t know what it said but i thought it was really cool. a challenge that was hard for me was going up the hill but it was super fun. I like this picture because it expresses the way the artists felt at the time when they did the piece.the picture is of different names of people and the way they felt because of thiong that had happened on their lives. the most challenging part of the day was when we were going up the hills because it was hard even if we had change the gears.what I like about the day was when we going down the hills.